Richard Buzard with his supervisor Jacquelyn Overbeck. Photo courtesy of NOAA. Richard Buzard, who is working on his doctoral studies in Geoscience, with Assistant Professor of Coastal Geography Chris Maio, has been named a NOAA Digital Coast Fellow. The two-year fellowship is designed to provide on-the-job training opportunities in coastal resource management and policy for postgraduate students and to provide project assistance to Digital Coast partner organizations. Buzard, a former Alaska Sea Grant research trainee, will be based in Anchorage and work under the supervision of Jacquelyn Overbeck, lead scientist and manager of the Coast Hazards Program within the State of Alaska’s Division of Geological & Geophysical Surveys. 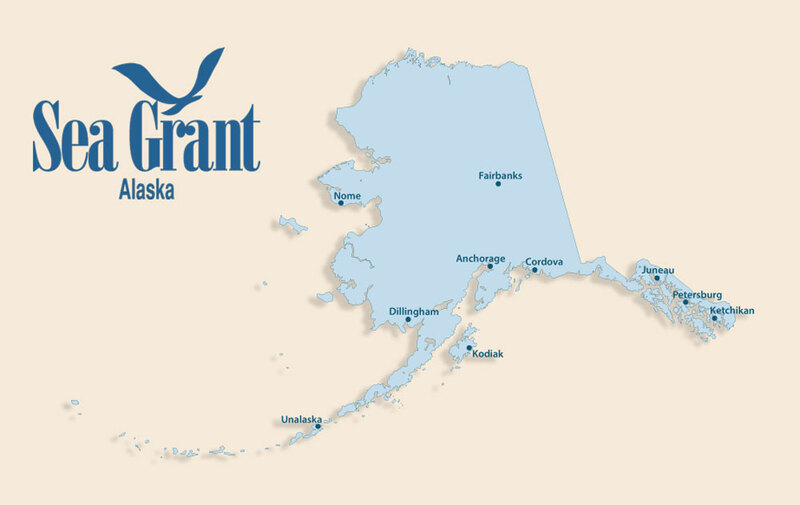 “The State of Alaska and the National States Geographic Information Council are very lucky to have Richard Buzard join as our organizations’ Digital Coast Fellow. Rich brings both the technical acuity and experience working with Alaska Native tribes that is needed to successfully map, monitor and move forward with coastal flood mapping in our state,” said Overbeck. Buzard’s master’s work at UAF, funded by Alaska Sea Grant, focused on measuring past and current rates of shoreline erosion in 11 villages in the Bristol Bay region, using tools such as aerial and satellite imagery, time-lapse video, drones, and ground penetrating radar. He also worked closely with tribal and city officials and others to install erosion-monitoring equipment and trained them to use it. He received his master’s this spring. Buzard’s Digital Coast fellowship work is designed to close vast information and data gaps about coastal Alaska’s vulnerability to flooding and shoreline erosion. His research will take place in 13 coastal communities in western Alaska and will include building a GIS-based online mapping tool for visualizing flood impacts. More than 80 percent of Alaskans who live in coastal communities are vulnerable to extreme storms, flooding and erosion. Critical infrastructure like homes, schools, tribal offices, fuel storage tanks, clinics and roads are in danger of being destroyed in many coastal villages. Alaska lacks adequate baseline data to adequately forecast and assess flood and erosion hazards and allow residents to plan for the future and minimize harm. “I’m very much looking forward to working closely with the residents of these villages to help them bolster their resilience in the face of severe climate change impacts,” said Buzard.